Game 1 of the NBA Finals shocked just about everyone that thought the Golden State Warriors would win the game by 20+ or more. The Cleveland Cavaliers fought hard to send the game into OT, but it would end badly for them as they might be out two key players for Game 2. Tristan Thompson got tossed from the game late in OT after he pushed the ball into the face of Draymond Green and a scuffle broke out. 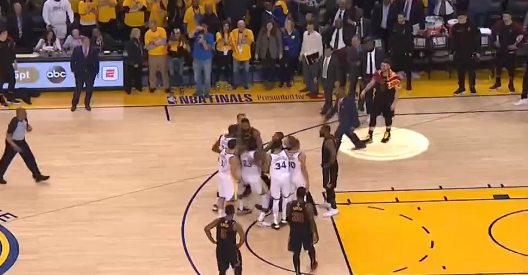 Kevin Love could also be in trouble after he was spotted making his way onto the court while walking towards the melee. He was pulled back, but the damage was already done. NBA rules clearly state that players would be suspended for leaving the bench during an altercation.